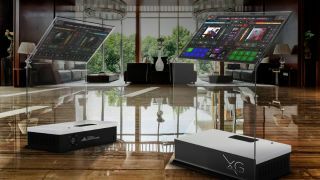 Following its foray into the ‘physical’ controller world with the Kontrol Master, Touch Innovations has gone all hi-tech again with the launch of the XG touchscreen platform. And when we say platform, we mean this almost literally, for the new device is an all-glass stand that features a 39-inch see-through projective capacitive touch display. The display supports 10 simultaneous touch points (that’s one for each finger, by our calculations) and comes in two versions. The standard XG has an Intel-powered Windows PC built into it, and comes with 500GB of storage. The XG Lite, meanwhile, omits this. All XG systems ship with Touch Innovations’ customisable Emulator 2 multitouch controller software, so you can create your perfect configuration of knobs, sliders, pads, buttons and other controls. Predictably, you’ll need pretty deep pockets if you want to buy either device; the standard XG costs $6,895, while the Lite model is available for a mere $5,999. Both are available through the Touch Innovations website.